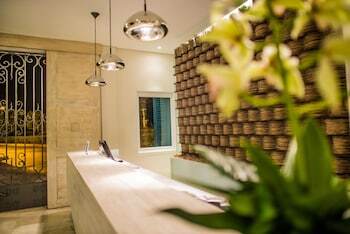 A stay at Bóvedas de Santa Clara Boutique Hotel places you in the heart of Cartagena, within a 15-minute walk of Puerta del Reloj and San Pedro Claver Church and Convent. Featured amenities include complimentary newspapers in the lobby, a 24-hour front desk, and luggage storage. A shuttle from the hotel to the airport is provided for a surcharge (available on request). Located in Bogota (Chapinero), this apartment is within a 15-minute walk of Lourdes Square and 54 Plaza Shopping Centre. Located in Manizales, El Eden Casa de Huespedes is connected to a shopping center, within a 15-minute walk of Palogrande Stadium and Torre de El Cable. Located in Cartagena (Cartagena Walled City), this hotel is within a 10-minute walk of San Felipe de Barajas Castle and Puerta del Reloj. With a stay at Hotel Casa Vieja in Santa Marta (Historic Center), you'll be steps from Simon Bolivar Park and Tairona Gold Museum.